Madhurima Nundy is Assistant Director & Associate Fellow at the Institute of Chinese Studies (ICS), Delhi. She holds a PhD in Public Health from the Centre of Social Medicine and Community Health, Jawaharlal Nehru University, New Delhi. She completed her MPhil from the same Centre. Before joining ICS she was Senior Programme Coordinator at the Public Health Resource Network and has been a Technical Consultant with the National Commission on Macroeconomics and Health. Her areas of interest include studying different health service systems, health policies and inequalities in health. She has several publications to her name. Dr. Tshering Chonzom Bhutia is an Associate Fellow at the Institute of Chinese Studies. She has a PhD from the Centre for East Asian Studies, School of International Studies, Jawaharlal Nehru University, India. Her thesis was titled ‘Applying Negotiation Theory to the Sino-Tibetan Talks, 1979-2006’. She has just completed a major research project comparing the Indian and Chinese government’s ethnic minority/nationalities policies. P.K.Anand is a Research Associate at the Institute of Chinese Studies. He holds a PhD in Chinese Politics from the Centre for East Asian Studies at the Jawaharlal Nehru University, New Delhi. Awarded in June 2017, his doctoral thesis is titled 'Market Dynamics and State Responses in China: Social Welfare and Industrial Workers, 1987-2008'. He also completed his M.Phil from the same centre in 2008. He completed his Master's in Politics (with specialization in International Relations) from the School of International Studies, Jawaharlal Nehru University in 2006. Muhammed Kunhi is a Research Associate at the Institute of Chinese Studies (ICS), Delhi. He recently submitted his PhD thesis titled “Memories of War and Construction of the Other: An Analysis of Mainstream Indian English Newspaper Discourse on China and Pakistan” to the Centre for International Politics Organization and Disarmament, in Jawaharlal Nehru University, New Delhi. He completed his MPhil from the same centre in 2013. His research interests include India-China relations, Environmental issues in India and China, and Non-traditional security. Nirmola Sharma is Research Associate at the Institute of Chinese Studies, New Delhi. She has a PhD from the Department of East Asian Studies, University of Delhi. In her PhD dissertation, she critically looks at the radicalization of the immigrant Indian community in China under the banner of the Indian National Army during the Second World War and its implications on wartime Sino-Indian relations. She was the recipient of the Institute of Chinese Studies- Harvard Yenching Institute Doctoral Fellowship for China-India Studies Program (2014-17). She was a Visiting Scholar at the Centre for the Study of Chinese Civilization at Fudan University for the academic year 2014-15. She was earlier awarded a Government of India, Ministry of Human Resources Development (MHRD) scholarship to study mandarin in China. She was part of an ambitious archival project to classify and catalogue materials related to modern China in the National Archives of India. She is interested in studying Sino-Indian interactions in the colonial period. Veda Vaidyanathan is a Research Associate at the Institute of Chinese Studies, New Delhi. She completed her Ph.D. from the Centre for African Studies at the University of Mumbai on the Resource Diplomacy Strategies of India and China in Africa. She was initially a doctoral fellow of the Indian Council of Social Science Research and in 2014 received the Institute of Chinese Studies-Harvard Yenching Institute (ICS-HYI) China-India studies fellowship. From 2015-16 she was a senior visiting fellow at the Centre for African Studies, School of International Studies, Peking University, China and was a visiting fellow at the Harvard-Yenching Institute in Harvard University the following year. She has conducted extensive fieldwork interviewing various stakeholders in India, China, Kenya, Ethiopia, USA and the UK and has presented papers in international and national conferences. Her research currently focuses on the interactions of India, China and other emerging powers with countries in Africa. Gunjan Singh is a Research Associate at the Institute of Chinese Studies. She has also worked as an Associate Fellow at the Vivekananda International Foundation, New Delhi. 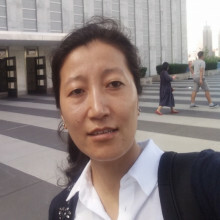 Her research interests include Chinese Foreign Policy, the Chinese Communist Party, Minorities in China, Mainland-Taiwan Relations, Chinese media, Chinese civil society Tibet and Space Security. She is the Assistant Editor of the CBW Magazine, published by the IDSA, is co-editor of Space Security and Global Cooperation, and has published in Strategic Analysis, International Affairs Review, Harvard Asia Quarterly, World Affairs: A Journal of International Issues and The Book Review. 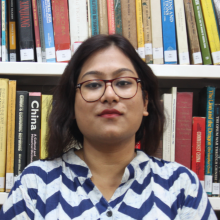 Prarthana Basu is a Research Assistant at Institute of Chinese Studies (ICS) Delhi. She recently completed her M.A. in Geopolitics and International Relations from Manipal Academy of Higher Education, Manipal. As a part of her master's curriculum, she worked on a dissertation titled 'China's Rise in the Emerging Global Order and its Implications'. She completed her B.A. (H) in History from Miranda House, University of Delhi. She has interned under Prof. Srikanth Kondapalli in Jawaharlal Nehru University and written an extensive research paper on the 'Chinese Naval Modernisation and its implications in the Indo-Pacific Region', which is publised online. Her research interests are China's role in environmental geopolitics, China's development in S&T, China's military modernization and India's foreign policy towards China. Thejalhoukho Casavi is a Research Assistant at the Institute of Chinese (ICS) Delhi. He submitted his M.Phil dissertation titled “Naga Customary Law and Multiple Modernities, 1880-1980” from the Dept. of History, University of Delhi. His M.Phil research engages with the complex interaction between the colonial legal system and the customary law of ‘tribes’. He completed his BA Honours in History from St Stephen’s College and MA History from Hindu College. Uday Khanapurkar is a Research Assistant at the Institute of Chinese Studies (ICS). He has completed his B.Sc in Economics (Hons.) from the Symbiosis School of Economics situated in Pune. While his academic endeavor has been in the field of economics, he aims to segue into the fields of International Relations and establish a career in academia therein. His areas of interest are geoeconomics, the nexus between economic interdependence and conflict and great power competition in the maritime domain. He authored an undergraduate dissertation entitled Peace in a Globalised Asia: 'The Relation Between China’s Conflictual Behaviour and Levels of Intra-Industry Trade, 2002-2010'. He is also the author of a book entitled 'The Pursuit of Prosperity: Exploring China’s Economic Dependence on India as a Deterrent to Conflict', written for the Chennai Centre for China Studies (C3S) and published by KW Publishers, New Delhi. Rashmi Muraleedhar is a Research Assistant at the Institute of Chinese Studies, New Delhi. She is currently assisting in a project which looks at the political, economic and military implications of US-China strategic engagement for India. She completed her Master’s in Politics (with specialization in International Relations) from Jawaharlal Nehru University, New Delhi in 2018. Her bachelor’s was in Chemical Engineering from Indian Institute of Technology – Guwahati (2009-2013). She is also currently pursuing a short research project at the Centre for Land Warfare Studies which looks into whether China is softening its approach towards India in the context of US unilateralism. Her interest lies in the cross section of Sino-Indian bilateral relations, Nationalism, Indian Foreign policy, and Great Power politics.